Instead of high volcanoes, as in many other islands of Indonesia, the terrain is rather hilly; the highest mountain is 1225 meters high. Geologically, Sumba is a continental fragment that broke off from Africa or Australia and floated to the edge of the line of volcanic islands of Indonesia. Sumba consists mainly of coral limestone. Only at the south coast there are also volcanic rocks. Sumba has no mineral resources. But when drilling in 2010 in Wanggameti National Park gold was found. No lush green covers the landscape. The north and east of the island are extremely dry and the landscape resembles a savannah. In open areas weather and wind have partially exposed the craggy rocks. In central highlands hills are covered with Alang grass. To the south and west it is green - but only in valleys and on the southern slopes of the mountains you find humid tropical vegetation. About 7% of the area of Sumba is covered with original forest. Sumba has a semi-arid climate. Especially the east of the island is characterized by the hot north-Australian climate. There is a dry season from May to October. From November to April it might rain. The monsoon or rainy season lasts from about 3 months in the east up to 5 months in the west. Rainfall ranges from 800-1000 mm per year in the northeast to 1000-1500 mm in the central region and up to 1500-2000 mm in the south-western part of the island. In the eastern part the average temperature is between 27 and 36 degrees Celsius. In the west the average is 2-3 degrees cooler. Night temperatures are significantly lower than in Bali. During the month of July to September night temperatures sometimes drop down to 15 degrees. The highest temperatures occur before the first rains in October or November. Lately, the monsoon has been very different. It seems to be in fact the so called "El Nino" that plays a role here. There are extreme droughts during but also heavy rain after "El Nino". Rivers in the south change their course because of flooding and destroy fields and bridges. Recently the shortage of water forced people in the northeast of Sumba to abandon some traditional villages and new settlements. In this area the residents are depend of permanent foreign aid. The best time for travelling for nature lovers is from April to July, after the monsoon, when it does not rain any longer, and when it is still green. In the Southwest of the island the period from October to mid-December is also possible, when it becomes a little green due to sporadic rains. If you are planning your travel in very long terms, you should avoid years with "El Nino" effect. The surfers' season is from May to September like everywhere in Indonesia. For swimming the waves at some beaches at the south coast are too high from July to September. Due to the specific climate water is very important for the people of Sumba. If you read travel-brochures of the district governments of Sumba, you should qualify the description, if you hear about great lakes and mighty waterfalls. Despite the relatively low population density, Sumbanese today can live only partially of their own crops. In arid dry regions of the northeast and on the high plains nothing can be grown. Only in valleys and along river banks small agriculture areas can be found. The only livestock are here Sumba horses and especially Indian Brahman cows. The agricultural products of the remaining areas of Sumba in alphabetic order are: Areca (betel nuts), cashew nuts, cassava (manioc, singkong, ubi kayu), cloves, coconuts, cocoa, corn, hazelnuts, jarak (jatropha oil crop), kapuk, peanuts, rice, robusta (lowland) coffee, shorgum (millet), soybeans, sugar cane, sweet potatoes, and vanilla. In addition to Sumba horses and water buffalos there are especially Brahman cows, goats, pigs and poultry. Farming methods are traditional. A lot is done with human power or with the help of Sumba horses and water buffaloes. The regional administration wants to reduce ritual animal sacrifice, especially buffalo sacrifice, since these animals are urgently needed for ploughing. In 1987 a decree was passed which forbids the sacrifice of more than 5 animals. Recently West Sumba decided to allow a maximum of 3 animal sacrifices per celebration - exceptions are common. Along all coasts of Sumba there is more or less intensive fishing. 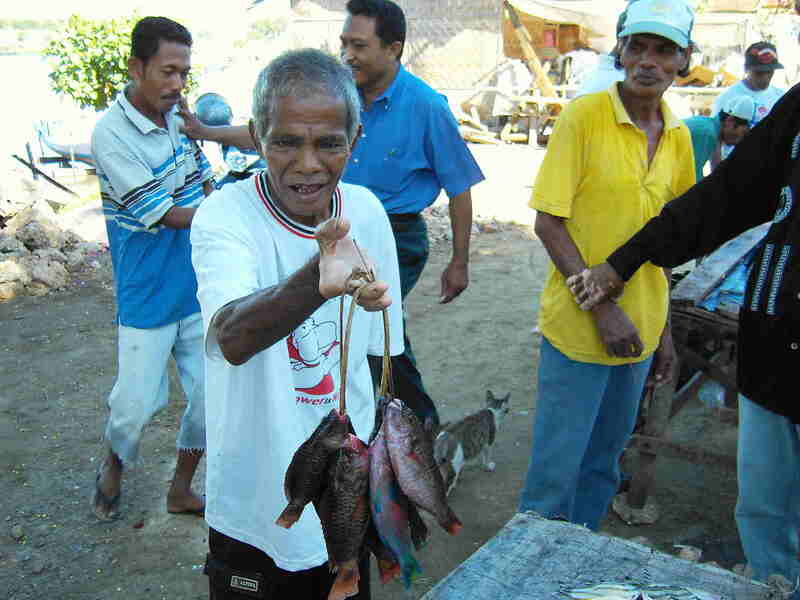 Nowadays fishermen are mainly immigrants from Sumbawa, Ujung Padang (Makassar), Lombok, and Savu. Fishermen from neighbouring islands who only come here for fishing in the waters of Sumba are often not welcome. It is claimed that they fish with dynamite and cyanide. Best time for fishing is during the monsoon season early in the year, and in July/August. Seaweed (Rumput laut) is grown in all calm and shallow water areas in east Sumba. For that seaweed shoots get infixed into ropes. The ropes are then anchored under water or they dangle connected with plastic bottles on the sea surface. Harvest is several times a year. From mature seaweed AgaAga is made, or it is used as animal feed or natural fertilizer. This economic activity has increased dramatically in recent times and unfortunately leads to a negative ecological change of shallow water areas. The water gets dull and the fishes lose their environment. Fishing is therefore often operated in these areas only as a side-line or stopped. Proceeds from the sale of seaweed are also higher than from agricultural cultivation. As a result, agriculture land is abandoned, in favour of seaweed monocultures. People migrate to the coast - initially without any kind of infrastructure and schools. The "El Nino" in 2015 stopped this development temporarily, because of seaweed crop yields declined. From salty sand of the lagoons they produce salt with the help of driftwood. Foreign aid organizations are trying to convince the Sumbanese to use new farming methods, forage, and crops. But as long as these attempts make no profit for the hierarchy of the Indonesian government, they are not supported by the state. In addition to that, big and complex irrigation projects, often fail because of ownership structure and local egoism. In the west of the island, in the districts Wewewa Selatan and Kodi Bangedo, Cassava is grown on huge areas. The plants get along with the natural rain. In the east of the island, the cultivation of sugar cane is started by means of artificial irrigation. At the government level it is planned to make Indonesia independent of sugar imports. Foreign investors were given appropriate land rights. There are 6 designated areas in East Sumba. If you come by plane to Waingapu you can clearly see 2 of these areas: coming from the North it is Napu and from the South it is Wanga. For the plantations landscapes are transformed into flat surfaces, hills get removed and valleys are filled up. Large water reservoirs are being built. The reservoirs are sealed with plastic film. The water comes from the rivers or is pumped from deep wells. This is justifiable, as long as no further agriculture is operated. Water rights were not agreed with foreign investors. In some areas, where competing farm systems are operated, one takes away the water from the other. Often the amount of water is not enough for conventional cultivation and new projects. There are already protests by local farmers in affected areas. Where the amount of water for sugar cane is no longer sufficient, Jatropha is planted. It is bush for the production of biofuels. Such projects are planned also in east Sumba and west of Mamboro. According to the opportunities of income from agriculture, the western side of the island is more populated than the east. In Sumba most people are descendants of Malays and Melanesians. There was also immigration from Timor and Savu in the south-eastern areas; at the north-western coasts Muslim people settled from Sumbawa, Ujung Padang (Makassar), and even from Arabia (Palestine). Colonial rulers, especially the Portuguese left their mark. The Sumbanese in physical appearance does not exist. The Savunese from Savu represent the largest and most influential group of non-Sumbanese. They endeavour to greater autonomy and an own administration district in East Sumba with the capital Melolo. Because of the missionary work of Portugal, the Netherlands, and Germany about 64% of the population are Christians (3/4 Protestants, 1/4 Catholic), 6% are Muslims, and 30% predominantly believe in the traditional Marapu religion (but statistics vary completely). The missionary work by German Redemptorists and the Dutch Church still continues today. Sumbanese people are often verbally critical about other people and religions. About half of the population are children. The rate of new-born children in Sumba is still rising. Most families have 8-10 children. "Many children, many blessings" - this motto seems to be true because children help their parents mainly in their fields and fetching water. For grown-up daughters they get a dowry: water buffalo, horses, and cows. There are also Transmigration (Transmigrasi) and Area Development Programs in Sumba. Everywhere new settlements are under construction. Partly such settlements are built in uninhabited areas with hundreds of houses lined up, a school and a new road; but partly they are also built in or around existing villages. Settlers mostly come from Sumatra, Java, Sumbawa, and Timor. Quite often the religion and way of life of the immigrants are different and so adapting problems are inevitable. Settlements in the dry north and northeast of Sumba make a predominantly poor and hopeless impression. Many settlements have been nearly completely abandoned (Lenang, Waiurang). In the south of the island the economic and social integration seems to be more successful. After all up to 90% of the farms in new settlements, are operated after a period of 10 years (as I counted in the villages of Kuruwaki and Lailiang). Australia installed a restrictive immigration and refugee policy in 2014. Boat people on their way to Australia are intercepted and sent back by the Australian navy. The refugees come from entire Asian and Arab countries. Sumba is a stopover for many migrants. Financed by Australia the government of NTT intends to build an internment or concentration camp in the area of Gaura in Sumba. The plot is apparently already bought. Due to the change of government in Australia this project is perhaps not followed up. Sumba is divided into 4 administrative districts. Apart from East Sumba there is the former West Sumba district, which in 2006 was divided into 3 districts: Central Sumba, West Sumba, and Southwest Sumba. Central Sumba and Southwest Sumba are currently building monstrous administrative centres, reminiscent of socialism, on the flat land. In East Sumba, Central Sumba, and West Sumba new ports are being built which from a technical point of view will never go into operation or are economically unprofitable. But it is obviously important for their identity. And finally in their programs they demand an administration with more competence, transparency, and less corruption. Sumbanese often say that the corruption in Sumba is the highest in Indonesia. In many decisions Bali is a model, especially in economic terms. Its own profile or backbone of the local policy is missing. Money seems to be the only engine of action. An example of the impending sale of the island is the unregulated or even subsidized sale of land to non Sumbanese. Hopefully the specific culture of the island will not fall by the wayside. Due to the long-term isolation of many areas and through subsistence economy, a great variety of cultural and linguistic differences have emerged within the population of the island. In the 50s the Indonesia administration referred to local languages as feudal languages and Bahasa Indonesia as the language of the new democracy. This had little effect, at least in the countryside Sumbanese speak their regional language among themselves. Even the opposite is true: on local NTT radio you can hear more and more songs in regional languages. Besides the national language, Bahasa Indonesia, there are 6 regional languages in Sumba. The common name for all of them is Bahasa Daerah or Bahasa Sumba. In West Sumba they are completely different. In East Sumba there is one Language but with many local dialects. For none of the local languages, you find a dictionary, everything is passed down verbally. Some languages are spoken by less than 50000 people, such as in Wanokaka and Lamboya. Equivalent in all languages are the words for water = wai or wee, man = umbu, and woman = rambu. In addition to that there are the languages of the immigrants (cf. above). So, in coastal regions they speak their own language, with the neighbouring village the specific Bahasa Daerah and with the administration Bahasa Indonesia. The majority in the place determines the common language. Many children start learning Bahasa Indonesia at school ... and then can they can speak Indonesian usually better than their parents. From time to time there are massive conflicts between villages, especially in the west of the island. This can simply be explained by the different languages: They do not understand each other! English is only helpful in towns. Without Bahasa Indonesia you will have understanding problems in the centre of the island. Even with Bahasa Indonesia you might have problems in the inland. However, if someone knows a little English, he will be determined to speak with you. See also some remarks in Orientation in Sumba. In most regions of Sumba and outside the 3 major towns, people live without access to clean water. Often water is pumped from rivers, distributed, and sold by tank trucks. Wells are scarce and often difficult to build because of limy ground. Many villages have no toilets at all. People's attitudes to health issues can be illustrated by the following example: Mosquito nets, donated from the UN, are often used as fishing nets, as well as protecting plants from birds or poultry. In the country, many public health centres (PUSKESMAS) are not or barely manned. Sometimes there is a sporadic mobile care (PUSKESMAS-Keliling). Malnutrition is widespread. Infant mortality rate is among the highest in the world. Also medicine is hard to get. The resources of Sumba are limited. Where there is crop failure, the poorest families have not enough to eat. Relief supplies by the central government to cover crop losses have stopped in recent years due to the economic crisis. Nevertheless many villages get permanently minimal portions of rice in order to cover their basic needs. However, the delivery is often irregular, and the distribution does not always seem to be fair. Statistics (from 2005) count about 38 doctors for 100000 people in Sumba, 84 nurses and 133 midwives. In addition to conventional medicine, there are a very large number of shamans. There are 17 health centres for 100000 people. According to statistics 30% of the patients have infections, 21% malaria, 13% injuries, 10% skin diseases, 26% others. The effects of famine are visible everywhere. In every village there are children who cannot lift their heads at the age of one year; children at the age of 10 have the size of a 6-year-old and a lot of children have different signs of malnutrition (Source Sumba Foundation). Sumbanese who work in Bali bring not only money home but often HIV. This issue is currently visualized on advertising panels. The traditional isolated lifestyle, where one clan lives in one village and with rare mixing with people from other villages causes problems. The theme inbreeding is known and visible. Sumba belongs to one of the rather neglected regions, due to its distance to the capital, relatively low population, and population density. In Sumba only a little more than half of the children will start school. Of these only about half finish basic education successfully. As soon as a child can contribute to their parents' income, this is more important than school. A remarkable number of especially strong and practically gifted children have to stay in the village and help their parents at home and in the fields. There is no money available for school. Often, the way to school takes more than an hour. In secondary school, a lot of practical knowledge is imparted, such as technical, biological, and medical know-how to get along in the village. These schools are rare and are often far away according to population density and demand, so that a daily return to the village is hardly possible. High schools are only in towns. The curriculum is excellent. But only those children can afford these educations which have relatives in town where they can board. Without school education and a good knowledge of the Indonesian language, children have less chance of a good future. Not all children in a family may later inherit the land of their fathers. Children without land and without education will remain unemployed. Sumba is one of the 5 poorest of the 30 provinces of Indonesia. A large proportion of the population lives on subsistence farming. People are dependent on natural resources and have few opportunities to sell their product surpluses at a market. Official statements about the poverty rate are pretty meaningless (between 28% and 85%). For the majority of the population there are no opportunities for an economic development outside the village, due to lack of jobs on the island. For those who cannot find work in Sumba, Bali is a first hope and Malaysia is the desired paradise because of higher wage levels, and almost same language (Bahasa Melayu). Not only men may have a chance of getting a job outside of Sumba. Numerically, there is a high proportion of women working as housemaids, mostly in Malaysia. Working women who finance their husbands and families, and what work abroad is really like, is a controversial subject (cf. Health HIV). Lately there have been cases where employment agencies sold minors to Malaysia. To prove the age of children, they used the identity cards of the older sibling or relatives. I talked about the environment in the other sections whenever it was relevant. I am aware that the following environmental issues are more likely subordinate compared with current problems of the people of Sumba. Due to its special flora and fauna the World Wildlife Fund categorized Sumba as a deciduous forest eco region. Sumba has a mix of plants and animals, of Asian, Australian, and oceanic origin. The northern part of the island originally was monsoon deciduous forest, while the southern part was evergreen rain forest, and had no distinct dry season. The forest in the north is nearly totally cut down. The forest in the south is partly preserved, like in the mountain regions Jawila, Tanah Daru and Wanggameti. There are a number of mammals, but Sumba is particularly rich in bird species, of which 7 are endemic species. A number of other birds are found only here and on some neighbouring islands. Among endemic species of birds are 4 endangered species: Red-napped fruit-dove, Sumba Buttonquail, Yellow-crested Cockatoo, and Sumba Hornbill. In addition, there are the usual typical tropical bird species, especially in southern forests. In the mountains and on the coast are lots of eagles, pelicans, and migratory birds from Australia. During dry season, meanders, and planes of the south-flowing rivers and protected forests in the south form a large water reservoir. Population growth and expansion of cultivated areas and thus an increased consumption of water and cutting down of forests is a major threat to the life on the island. Still wood is cut down, although the government has banned it by law. Also by law: wood for new buildings, must be imported from other islands. The soil in Sumba mainly consists of porous limestone. Where the humus layer is too thin, the water seeps through. Therefore irrigation programs must be adjusted so that the water table is maintained. Due to the extremely large increase of seaweed / AgaAga production in shallow water areas the flora and fauna there gets driven out. In order to protect nature two national parks were designated in 1998: Laiwangi Wanggameti National Park and Manupeu Tanah Daru National Park. Please note: In these national parks you do not get pampered as in North America. Particularly in Laiwangi Wanggameti National Park, there is absolutely no infrastructure. In addition to these parks, there are numerous nature reserve areas.